I have been a little absent this last week. I had minor surgery on the 15th and it is taking me longer to get back on my feet than I expected. I am still having some issues but I am trying my best to get back together. I think I worried myself so much prior to the surgery and kept myself so busy I wore myself out and now I am paying the price. The busy holiday season is upon us. Thanksgiving week already, how did that happen? 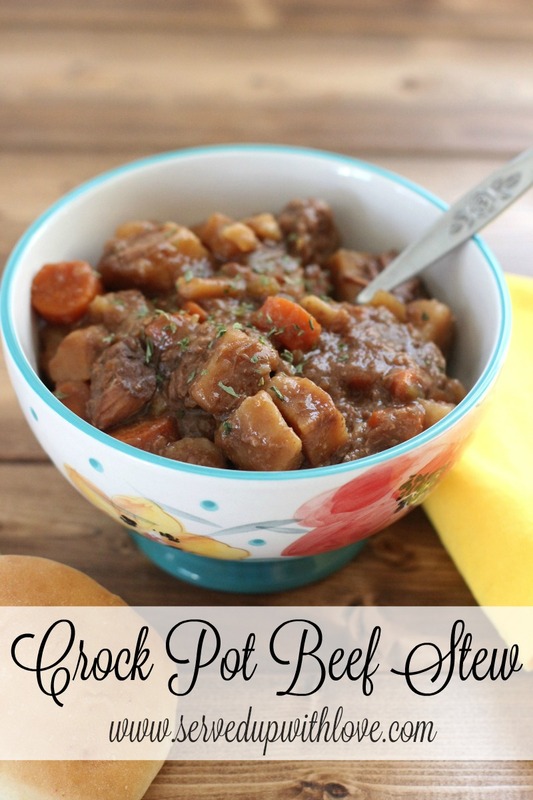 I know myself I will have busy days and my crockpot is going to be put to good use. So I wanted to share a recipe that I have made several times and it does not dissapoint. 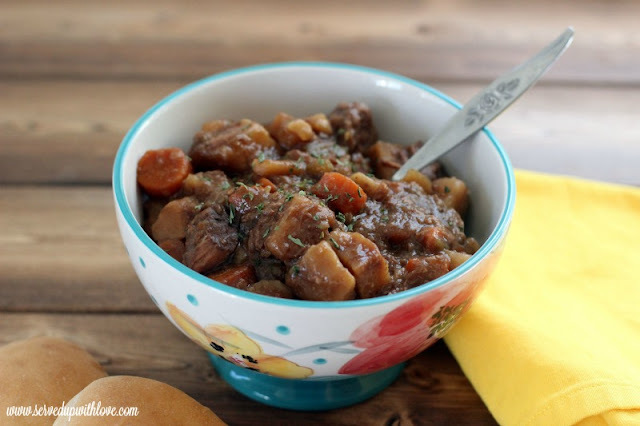 The first time I made this beef stew my son wanted to eat every last bite and I had to steal a bowl and put away so his dad had some when he got home from work. Of course, when I made it that time a lot of the veggies cooked down and it wasnt much in the pot. This time though was different. Now he says that was not what he had that night that it was roast. We are still arguing over who is right here. I know it was me, but he thinks otherwise. Oh well, just the same, he ate this too! I threw this together on my lunch break, seriously I had 20 minutes left to throw this together. If it wasn't for all the chopping of the veggies it would have taken less time. This can also be prepared the night before and placed in the fridge to place in the heating unit in the morning to save time on hectic mornings. The secret to my beef stew, McCormick Slow Cookers Hearty Beef Stew mix. You can not go wrong with this, it does all the work for you. I did not take to many pictures during the preparing process because like I said I had 20 minutes and I was rushing. Not only that, I had a mess! 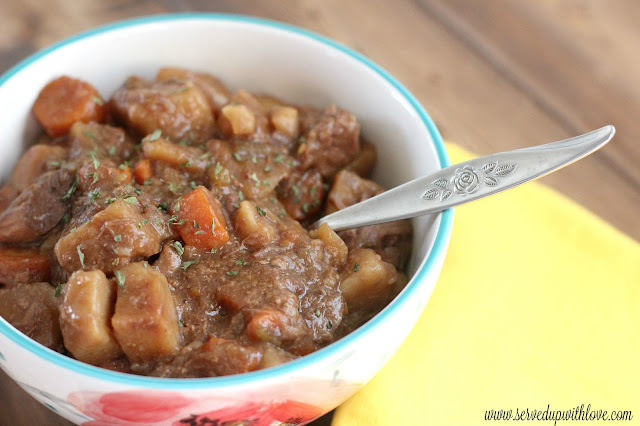 Place the stew beef, chopped celery, sliced carrots, chopped potatoes, and the seasoning packet in. Add the water called for and turn this baby on. I cooked on high since it was put on late. Normally I would cook this for 6-8 hours on low. The house smelled so good when I returned home that evening. I also doubled everything and made sure my pot was full. I have a nice container of this in the freezer for a quick lunch or quick dinner one night. 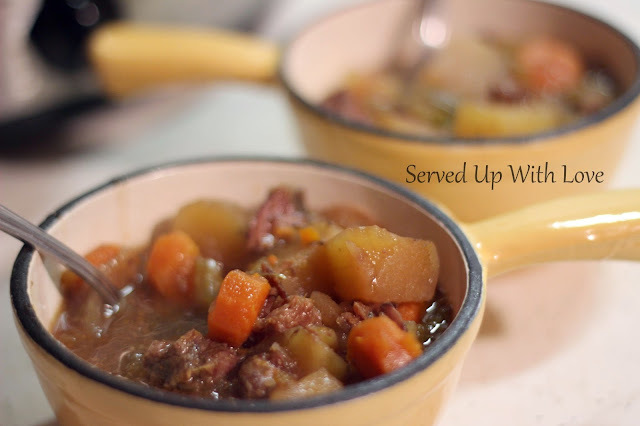 Nice hearty beef stew on a cold day makes everything so much better. ***McCormick had nothing to do with this post, I am not being compensated in any way for this review. I just like the product! Thanks for all the well wishes on here and facebook. That means more to me than you will ever know. Hope you feel better soon. I'm thinking this stew would help!